BEWARE OF JURY SCAMS! Click HERE for more information. For building information, directions, parking and a list of local eateries, click here. Parking fees and mileage to and from the courthouse will be reimbursed along with your attendance fees. Click here for directions and parking. You must show a photo ID to enter the courthouse. You must pass through courthouse security. Do not bring cell phones, cameras, recording devices, or other electronic devices (such as MP3 players). Bring your summons and provide it to the jury administrator when you are checking in. Do not be afraid to ask questions about your jury service. If you have received a jury summons and you have a disability and need special accommodations, please contact your local jury administrator. Click here to read more about our Services to Persons with Communication Disabilities. Potential jurors have the option of submitting their juror qualification questionnaire and summons information on-line through the eJuror system. Jurors can also update personal information on-line. Simply log onto the system using the juror participant number located next to your name and address on the form you received in the mail. Click here to go to eJuror. Please be advised the U.S. District Court sends out letters requesting juror qualification information to randomly selected registered voters in Kansas. Collecting this information is the first step of a process undertaken every two years to develop a pool of qualified jurors who could be called for federal jury service. The letter directs recipients to www.ksd.uscourts.gov/eJUROR to answer a short series of questions and provides the phone number 800-959-9519 to call with any questions or concerns. The only personally identifiable information the court requests from you is a participant number, which is provided on the letter, and your date of birth. The court will not ask for your Social Security number, credit card or bank account information, or any other sensitive information. If you are uncomfortable providing information electronically through the secure website, or you do not have access to a computer, it is not necessary to contact the court. A jury questionnaire form will automatically be mailed to those who do not respond via eJUROR. If you are still concerned about the legitimacy of any information being requested of you, please contact the jury department at ejuror@ksd.uscourts.gov or 800-959-9519. Every month a number of jurors are selected from the qualified wheel and sent jury summons. The jury information form may be completed and returned by mail or completed on-line at eJuror. The District of Kansas covers the entire state of Kansas so your summons will tell you which division you would report to, Kansas City, Topeka or Wichita. Pursuant to 28 U.S.C. 1861, all litigants “have the right to grand and petit jurors selected at random from a fair cross section of the community.” The court uses a two-step process to select jurors. First, a master jury wheel is created by selecting names at random from the official list of registered voters. Then, names are randomly drawn periodically from the master jury wheel to receive juror qualification questionnaires. 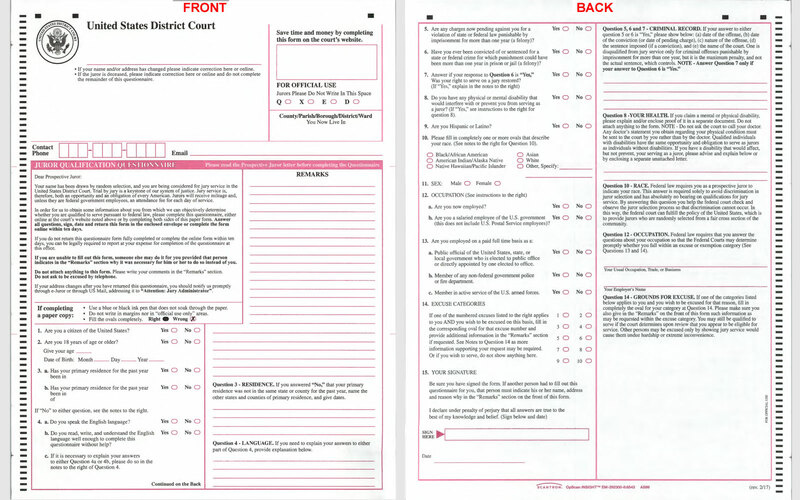 Individuals’ answers to these questionnaires determine whether they are legally qualified to serve. If so, the names of those persons are put in a second or qualified wheel. As prospective jurors are needed for a specific trial or grand jury, jurors summonses are sent to persons randomly selected from the qualified wheel. All of these selections are carried out through a properly programmed electronic data processing system for pure randomized selection. The pure randomized process ensures that the mathematical odds of any single name being picked are substantially equal. Please see D.Kan.Rule 38.1, Random Selection of Grand and Petit Jurors, for additional information. Jury scams have seen a resurgence in recent months. If you receive a phone call or an e-mail from someone claiming to be a court official, DO NOT give them your social security number or credit card information. Our court will never ask for personal information over the phone or by e-mail.